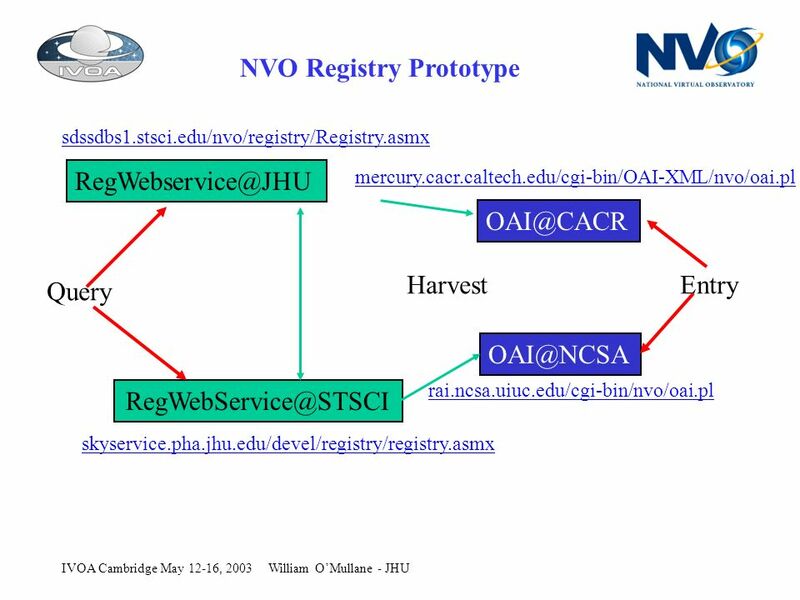 William OMullane - JHUIVOA Cambridge May 12-16, 2003 NVO Registry Prototype Harvest Query Entry. 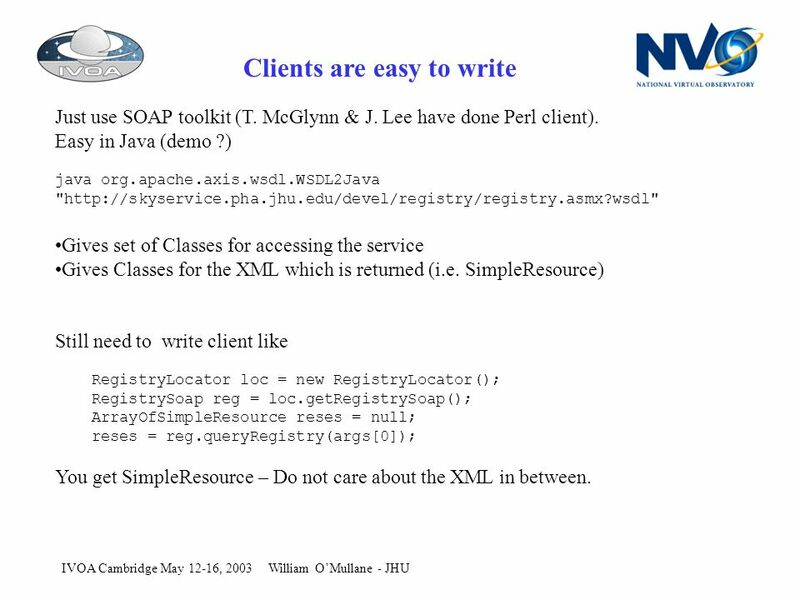 2 William OMullane - JHUIVOA Cambridge May 12-16, 2003 Clients are easy to write Just use SOAP toolkit (T. McGlynn & J. Lee have done Perl client). Easy in Java (demo ?) java org.apache.axis.wsdl.WSDL2Java "http://skyservice.pha.jhu.edu/devel/registry/registry.asmx?wsdl" Gives set of Classes for accessing the service Gives Classes for the XML which is returned (i.e. SimpleResource) Still need to write client like RegistryLocator loc = new RegistryLocator(); RegistrySoap reg = loc.getRegistrySoap(); ArrayOfSimpleResource reses = null; reses = reg.queryRegistry(args); You get SimpleResource – Do not care about the XML in between. 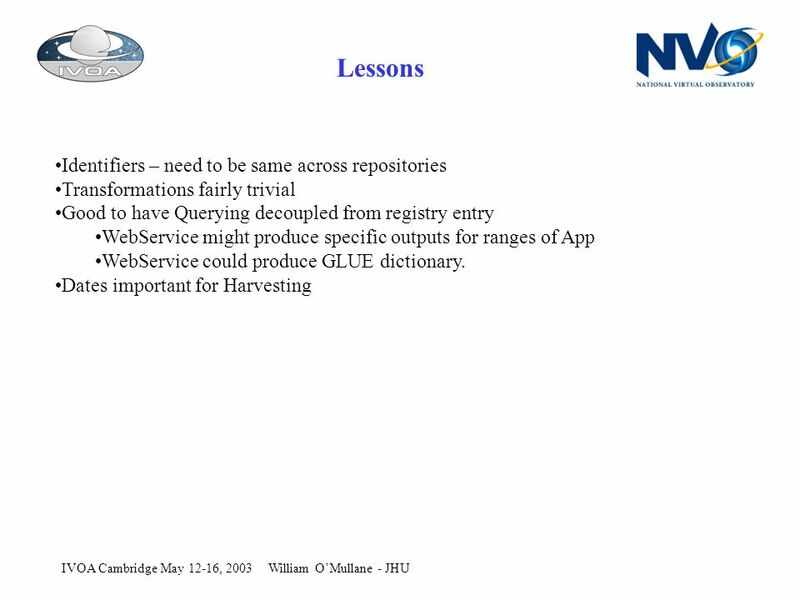 Download ppt "William OMullane - JHUIVOA Cambridge May 12-16, 2003 NVO Registry Prototype Harvest Query Entry." 1 Experience Building The World Wide Telescope aka: The Virtual Observatory Jim Gray Alex Szalay. IVOA Registry WG, IVOA Registry WG Pune, 28 Sept 2004. Registry Interop Summary IVOA Interoperability meeting Cambridge, Boston, MA May 2004. London Registry meeting 19–20 March 2003 André Schaaff GLU – Générateur de Liens Uniformes Three sides : –GLU dictionary maintaining URLs according to. Yuji Shirasaki National Astronomical Observatory of Japan JVO JVO Publishing/Searchable Registry Implementation Experience IVOA Interoperability Meeting. M. C. Leoni 1, T. A. McGlynn 2, R. D. Williams 3 1 European Southern Observatory, Germany 2 HEASARC, Greenbelt - MD, USA 3 Caltech, Pasadena - LA, USA. National Center for Supercomputing Applications MyProxy and NVO or Web SSO for Grid Portals GlobusWorld 2006 Washington, DC, USA September 12, 2006 Mike. Sept. 2003NVO Team Meeting / Victoria1 VOQL/ADQL/MYDB for VO William OMullane Johns Hopkins University T HE US N ATIONAL V IRTUAL O BSERVATORY. 8 September 2006NVO Summer School Aspen1 Publishing and Resource Discovery with Registries Ray Plante Gretchen Greene T HE US N ATIONAL V IRTUAL. NVO Summer School, Aspen Center for Physics1 Publishing and Resource Discovery with Registries Ray Plante Gretchen Greene. September 7, 2005NVO Summer School1 Building a SkyNode Server Tom McGlynn NASA/GSFC T HE US N ATIONAL V IRTUAL O BSERVATORY. NVO Summer School, Aspen Center for Physics1 Publishing and Resource Discovery with Registries Ray Plante Matthew Graham. 14 Sep 2004 NVO Summer School1 Introduction to Web Services Technology Matthew J. Graham CACR/Caltech T HE US N ATIONAL V IRTUAL O BSERVATORY. Sept NVO Summer School1 Cone, SIAP, and OpenSkyQuery Client Development Gretchen Greene, Maria Nieto-Santisteban T HE US N ATIONAL V IRTUAL O. 2004-09-15NVO Summer School, Aspen Center for Physics1 Publishing and Resource Discovery with Registries Ray Plante Matthew Graham.